"After writing this text, I read it, first to one son, age eight, then to the other, age five. Each responded with 'You wrote this about me, didn’t you Mom?' And I could say to both, 'Yes.'" What child isn't curious about those first days of life? 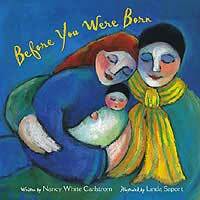 In Before You Were Born Nancy White Carlstrom celebrates the mystery of how each child is a part of God's plan and the wonder of how a family grows and changes when a child arrives. With vibrant colors and joyful images, illustrator Linda Saport tenderly conveys the excitement and love with which parents welcome children into their lives. This lyrical celebration of every child's life takes its inspiration from Psalm 139.